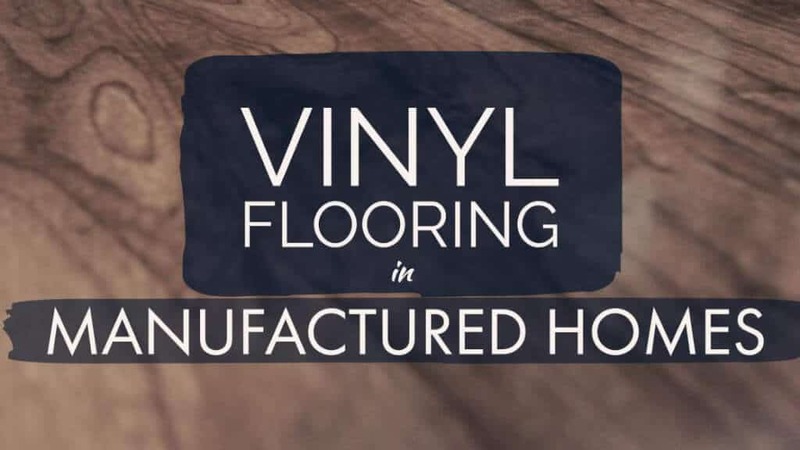 Luxury vinyl tile is a hot new trend in home decor and design but can you use vinyl tile in manufactured homes and Should you? Flooring plays a huge factor in home decor, energy efficiency, and comfort. It can completely change the look of a room and help reduce your heating and cooling costs. There are several flooring options available so it’s important to learn about each material’s strengths and weaknesses. We’ve previously covered a few flooring choices here. Today, we’re going to take a look at using vinyl tile in manufactured homes. Vinyl tile in new manufactured homes, especially kitchens, baths, and mudrooms, is a huge trend. If it’s in the new homes then it must be a good choice for older mobile homes, right? I’ll be honest, I thought linoleum and vinyl were essentially the same product. While linoleum and vinyl look alike and are both available in rolls and tile, they are completely different. “Linoleum is made from natural components like linseed oil, tree resin, wood and cork flours, limestone, and pigments. It even comes with a jute backing. Its ingredients provide it with that unique scent, evoking memories of schools and kitchens of yore. Should You Choose Linoleum or Vinyl? Vinyl has lower maintenance than linoleum and is great for the do-it-yourself crowd because it’s easy to install. Vinyl flooring is also more budget-friendly than linoleum but it has a shorter lifespan. Linoleum can last 20-40 years while vinyl tends to have a 10-20 year lifespan. Linoleum has many benefits but you must apply a sealant over it to give it a full water resistance. Vinyl doesn’t need any additional sealants. The water resistance and cost makes vinyl tile an ideal material for mobile home flooring. In addition to better vinyl, there’s been a good deal of advancement in the adhesives industry. Glues are stronger and last longer than ever. Together, the advancements in vinyl and adhesives have created a vinyl tile that is easy to install, long-lasting, and durable. Keep in mind, you cannot compare the box of tile at your local dollar store to the more expensive vinyl tile at your flooring center. Flooring tends to be a ‘get what you pay for’ product. There are different types of vinyl tile available based on thickness, material composition, pattern, and adhesive. Luxury vinyl tile (or LVT) has become a hot trend in the home building and design world. But what exactly is luxury vinyl tile? Vinyl tile with patterns replicating wood grains, stone patterns, or traditional tile designs are very popular! Designers are putting these vinyl tiles everywhere. The vast array of designs make vinyl tile a great flooring choice for manufactured homes. Luxury vinyl tile can come in an array of shapes and sizes. Standard square, rectangle, and plank are the most popular choices. You will want to purchase all the flooring you need at one time. This is especially important if you are using a single floor covering for your entire home. You can’t count on stores to keep the same patterns or even the same brand. There are also differences in the manufacturing so products produced Monday may be a shade darker than Thursday’s run. There are a few differences between manufactured homes and site-built homes and they should be considered when remodeling. Subfloors and marriage lines are the most obvious differences. Flooring changes will involve both. Just like a site-built home, manufactured homes have a subflooring. The difference is that the lower-cost manufactured home models usually have particle board subfloors or OSB. Particle board soaks up water like a sponge so it is important that the subfloor be well-protected in all rooms with water features. Subfloors that are bowed or have soft spots must be repaired or replaced before you install new floor covering. The marriage line in double wides and triple wides is another issue that must be considered when choosing a floor covering. Professionals stress that traditional tile should not be used if you have to cross the marriage line. Uneven leveling between the two sides can cause cracking in traditional tiled flooring. Using carpet and vinyl, in either a single sheet or tile, remedies that issue. 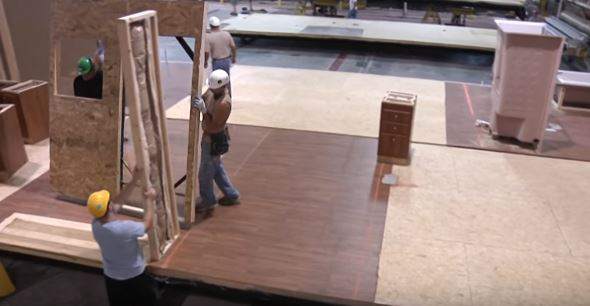 You may or may not have to remove your home’s flooring before you lay new flooring down. You can install floating laminate flooring right over carpeting. Some vinyl tile brands can be installed on top of sheet vinyl, too. If you have to replace or repair your manufactured home’s subfloor you will need to remove the current floor covering. 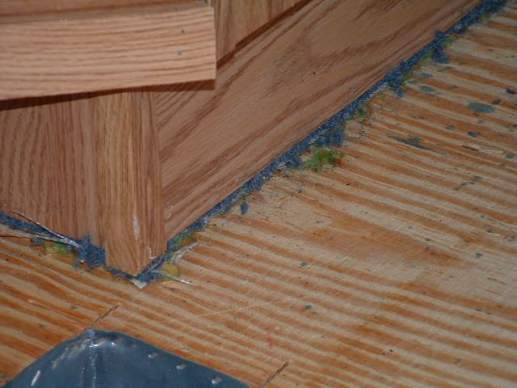 Learn how to patch a mobile home subfloor here. 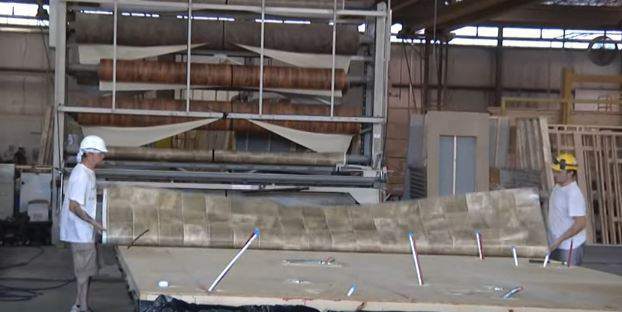 Removing carpet, linoleum, or vinyl sheet flooring from a factory-built home can be difficult. Manufactured homes are built from the ‘ground up’ so carpeting and sheet flooring is laid down in a single sheet before walls are built. You can’t just rip it out. Sheet flooring is often glued as well so you can expect a good wrestling match. You will have to cut the carpeting or vinyl around the perimeter of the room and ‘dig out’ as much as you can from under the wall. You can learn more about replacing a mobile home’s flooring here. Stone-like tiles are fitted with or without grout into various patterns. Woodgrain planks adhere to the subfloor after you remove an adhesive strip on the back. Locking tiles snap together without glue or adhesive. Most installations are completed with just a few tools: chalk-line, rubber mallet, pencil, and a tape measure. Luxury vinyl tile can be grouted to increase its water resistance. Grouting can make the flooring look more cohesive and more like ceramic tile. Durable and easy to maintain, vinyl tile is a practical flooring choice for manufactured homes. Stain and moisture resistant, vinyl tile cleans easily and keeps your home comfortable. The soft and spongy feel of the luxury vinyl tile makes standing and working easier on your feet and back, too. Here’s a comprehensive list of luxury vinyl tile manufacturers. 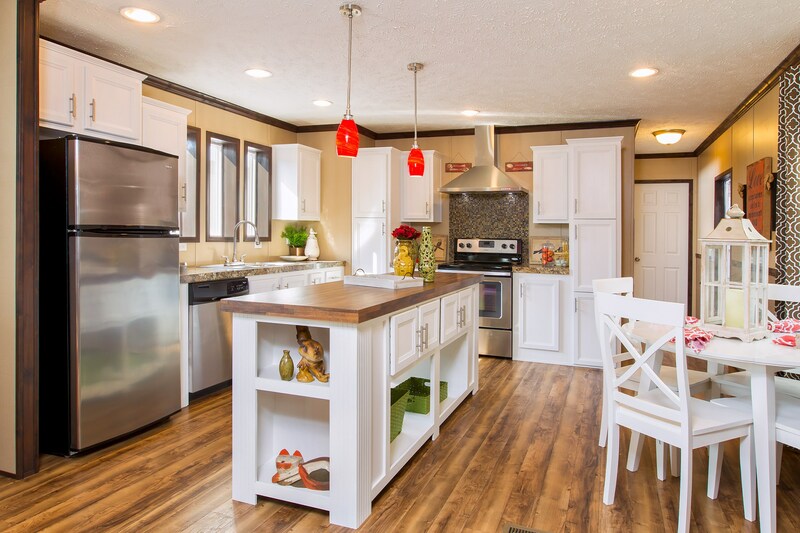 Learn more about flooring replacement for manufactured homes here. As always, thanks so much for reading Mobile and Manufactured Home Living! Have you installed luxury vinyl tile in your home? We’d love to see it! Excellent article! Very thorough and good information. WHERE DO I FIND THE ALUMINUM STRIP TO COVER THE MARRIAGE LINE FROM VINYL TO VINYL. THE MANUFACTURE SENT THE WRONG ONE THAT WOULD BE FOR VINYL TO CARPET AND THEY SAY THEY DON’T HAVE ANYTHING ELSE. Lowe’s or Home Depot usually stock those but I would advise getting another material besides the aluminum. The aluminum is great and it won’t rust but the wood and flat blacks look a little better in my humblest of opinions. Best of luck! How do you address the “marriage line” gap in a double or triple wide home when placing Luxury Vinyl planking . What is the best way to fill the gap and with what. As long as it’s not a huge gap you should be able to use weatherstripping foam or a gasket. I don’t think the expanding foam in a can is a good idea because it expands significantly. It shouldn’t be a very wide gap – if it is you may want to check your level. Great information. I have despised the laminate wood floors that were installed by the bank before I bought my shack. The laminate is not bad, it’s the installation and the sloppy, cynical way [ “it’s just a trailer” attitude, I suspect ], it ticks me off everytime I see the hack job that was done on it. Never had a problem with vinyl for all the reasons you cited. It will definitely be in consideration. As it is now, I would rather the flooring had been left alone !